reaction against this approach to animation. 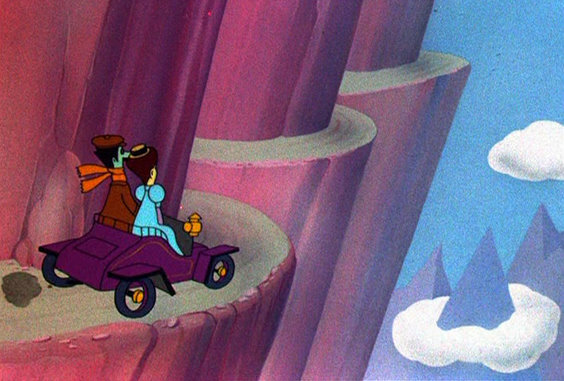 Watching Duck Dodgers in the 24 ½th Century (1953), few people complain that the ground of Planet X is pink and purple. Or that the sky is more green than black. 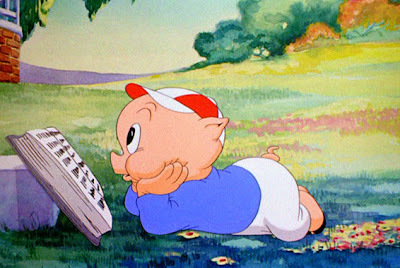 We sense that Daffy Duck, Porky Pig, and Marvin the Martian naturally fit into this off-kilter world and we go with it. It took time for Hollywood to realize that audiences would accept a non-realistic approach to cartoon backgrounds. More than anyone, Maurice Noble pushed background stylization into the mainstream. 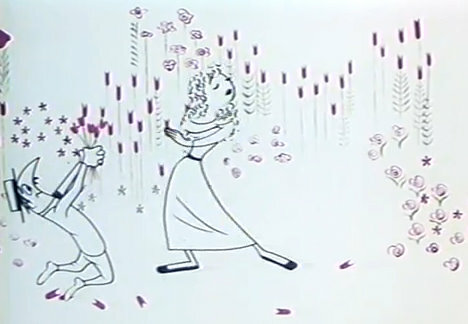 Chuck Jones and others began experimenting with more stylized backgrounds. 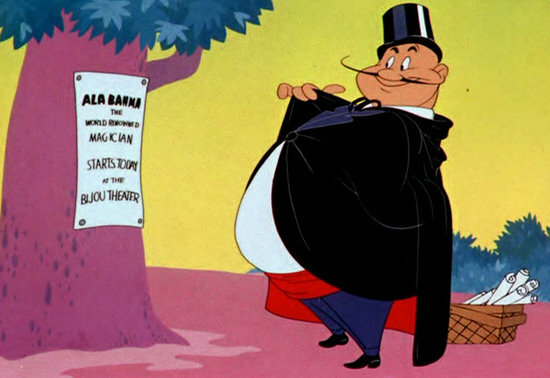 In later years, Noble would sometimes downplay the influence of previous Warner Bros. animators and the UPA cartoons on his work. However, his boss Jones was always keenly aware of innovations emerging both within their own studio and at their rivals. Jones embraced the idea of greater abstraction and he hired Noble because he sensed that Noble could do these new striking backgrounds better than anyone. Great artist though he was, Maurice Noble didn’t arise from a vacuum. Artists were putting their unique signatures on backgrounds since the beginning of animation. 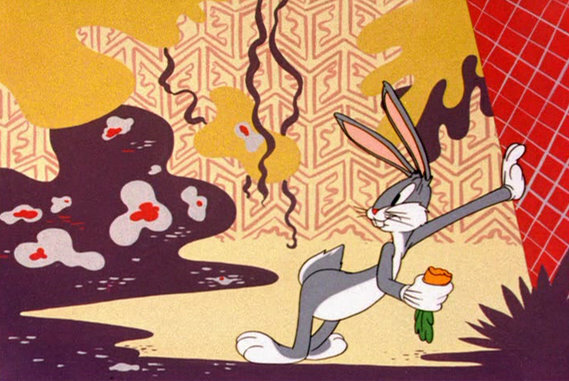 Experimentation bloomed in the 1940s, with some of the most envelope-pushing ideas arising from the Chuck Jones’ unit. Here’s a selection of some great backgrounds from cartoons of the 1940s and early 1950s that paved the way for the work of Maurice Noble at Warner Bros.
work by John McGrew and Eugene Fleury. uses fabric patterns, bright colors, and all sorts of strange designs. Short and was very influential on subsequent animation. Purchase Looney Tunes Golden Collection, Volume One DVD set at Amazon or Barnes & Noble. Rent Disc Two of Looney Tunes Golden Collection, Volume One DVD set at Netflix or other rental service. 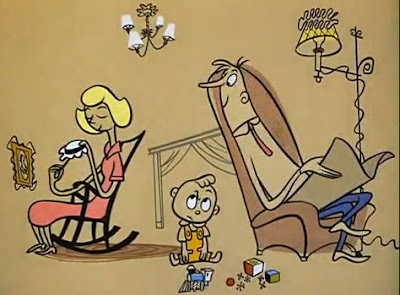 The Fourth Greatest Cartoon... Ever!